When the Franks contacted us, they asked the intriguing question of whether it would be possible for them to be buried shoulder to shoulder? 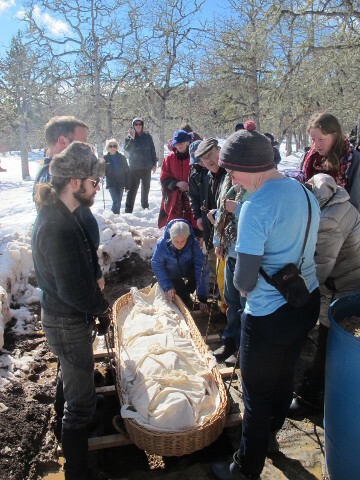 The sentiment was something we understood and appreciated, and since Herland Forest does not use concrete vaults, there seemed to be no insurmountable problem with creating a natural burial in which people could rest side by side. The questions that did come to mind involved finding a practical way for that to happen since the interments would most likely come at different times. Here’s the story of the solution we came up with. The graves in Herland Forest are dug by hand for a number of reasons. First, we want to limit damage to the roots and trees nearest the grave, and at this scale, a backhoe isn’t a precision instrument. 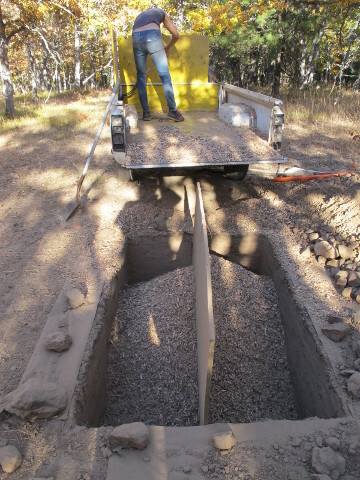 Second, we strive to limit the soil compaction which happens when heavy machinery is driven through the forest. The health of the root systems in the forest depends in part on the ability of rain and oxygen to infiltrate the soil; compacting the soil closes off the ability of the soil to breathe. And in part, as the sextons who do the actual digging, we feel that there’s something deeply resonant in doing this work the ancient way out of solidarity with those who’ve been digging graves as long as humans have been human. When a grave is being dug, we tailor the size of the grave to suit the wishes of the family. For example, if the remains are going to be buried in just a shroud, then the grave would be dug to fit the shrouded remains. But if the remains are going to be buried in a wicker basket, for example, then the grave would need to be wider and longer. 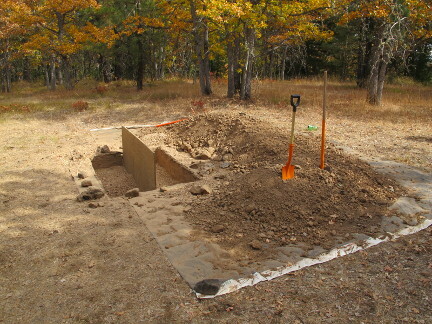 Another benefit that comes from digging a grave by hand is that people can stand close to the opening as you see here. 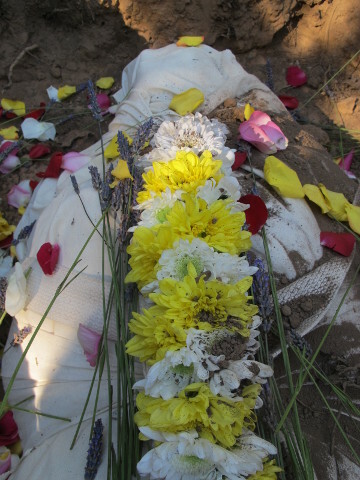 In our experience, many people derive satisfaction from participating in the process of lowering the remains into the grave. Because the integrity of the soil around the grave is preserved, they can stand closer to the opening, which makes it easier for them to lower the remains . It’s common for people to purchase adjoining plots so that when the need arrives, they can be buried in the same location. 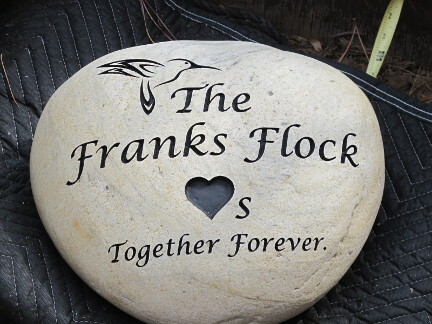 But the Franks wanted something more intimate than that; they wanted to be buried shoulder to shoulder, and we wanted to help fulfill that desire. Most cemeteries use a regimented format in which graves are laid out in a tight grid. In Herland Forest, graves are located in clearings between the trees, which we believe creates a more welcoming place for people to gather in memory of their loved ones. A key part of our vision for Herland Forest is for it to be a place that helps maintain the emotional connection between the living and those who have passed. So for us, it’s very important that the grave sites are natural and welcoming. 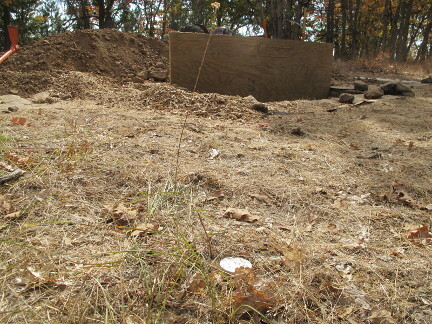 Because the layout of the graves in Herland Forest is not regimented, we can locate a grave in the center of a clearing thereby limiting the disruption of the forest’s root systems. Once the grave is in place, we then lay out the official boundaries of the burial plot so that it’s centered on the grave. In the Franks case, we worked from the understanding that we would create an oversize grave that would bridge the boundary of two adjoining plots. We undertook to create a grave that was the usual length, but more than 4 feet wide. 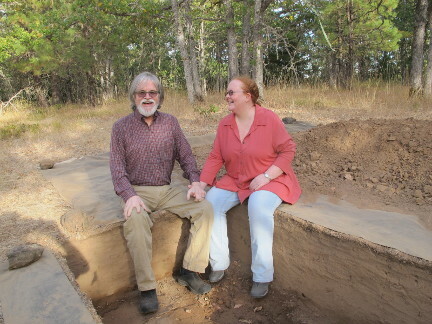 For scale, here’s a pic of the Franks visiting while the grave was being dug. The pic will give you a feeling for the length and width of the grave-to-be, but the full depth hasn’t been reached yet. We knew that the biggest challenge we would have to overcome would involve creating a way to inter one set of remains in a manner which allowed the other set to be interred at a later date without disturbing the first set. The solution we came up with involves installing a temporary barrier cut from a sheet of 3/4″ thick treated plywood. This would divide the grave into two sections. Then, when it came time to inter the first set of remains, we would be able to remove the wood chips from one side of the grave, inter the first set of remains up against the plywood, and then refill that side of the grave with the earth and wood chips we’d just removed. Then, when the second grave is needed, we excavate the other side, inter the remains and refill the grave. Then the plywood barrier would be removed and an appropriate tree planted. Here’s a pic of the grave showing the location marker in the foreground of the pic. Herland Forest goes out of its way to encourage plant growth within the forest in an effort to create a vibrant landscape in which the graves will blend in as an unobtrusive part of nature. To the extent that we’re successful, that could make it difficult for someone to locate the precise resting place of a loved one, so we mark each grave with a traditional surveryor’s marker. In order to ensure that people don’t trip over the markers, they’re installed flush with the ground. 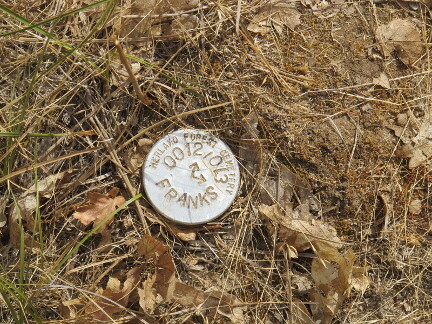 That could make it difficult years later to find a marker down among the leaves and grasses, so we log the GPS coordinates of the marker to help people arrive at their general location. Then, if a marker is still being difficult to find, there’s a backup option in that the aluminum markers are mounted on a length of steel rebar driven into the ground. Even under a couple of inches of leaf debris, the rebar can be easily located with a metal detector. 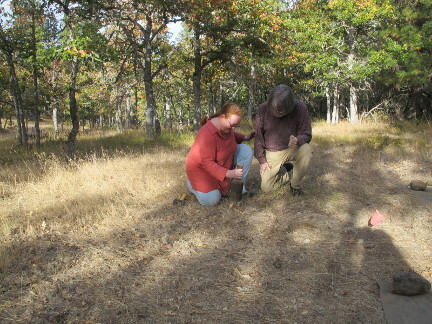 Here’s a pic of the Franks using a wooden mallet to drive their marker into ground, to literally stake their claim to this bit of the Herland Forest. the opposite of life is not death, it’s indifference.